A Kids bedroom is a private room where they can usually sleep for the night or relax and play during the daytime. Bunk Beds are a perfect way to save space in a small bedroom, allowing two children to sleep comfortably in the floor space of one bed. 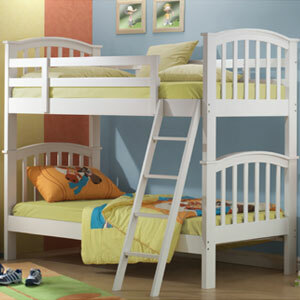 Kid's Bunk beds are fun piece of bedroom furniture suitable for small rooms where space is an issue. Children's Bunk beds are designed to sleep two kids in the same floorspace which would normally sleep only one child. Usually bunk beds consist of two mattresses arranged in a wooden or steel frame that places one mattress directly above the other. Some bunk beds have enough height to allow for storage under the bottom bunk. Othershave more room underneath by placing the bottom bed at a right angle to the upper bunk, forming an L layout. There are many types of kids bunk beds made from a variety of materials in a never ending array of styles. The typical bunk beds is of a wooden construction and one mattress directly above another mattress. Another variation features a double bed on the bottom, with a single on the top. A futon bunk bed features a bottom futon-styled bed that can be made into a small sofa during the day and can be turned into a kids bed at night time. Standard features for the vast majority of bunk beds include a ladder and a safety rail on the top bunk for safety, to stop your child accidently falling out of bed!. The ladder can be static and attached to the wooden or steel frame, or it can be a detachable accessorywhich can be moved and placed in any position to access the top bunk. There are lots of things to consider when making a decision on which bunk bed you prefer and which features you require. The purpose of a bunk bed is to save space, so a good idea of how much space you have to spare in your room will be the initial thought. Which material do you prefer is another question to answer; wood, steel or aluminium? The age of your kids would also need to be considered, as small kids won't be able to get into the top bunk without help. Your child's Safety must also come first, and especially whilst sleeping at night. Your bunk bed should always have a safety rail on both sides of the mattress to stop your child rolling out of the bed during the night. If your bunk bed is a self assembly kit, please make sure all bolts are tightened properly and everything is secure. Also check the manufacturers specifications to make sure the weight limits are correct to prevent accidents and injury.